Try our artisanal unrefined sea salt! It contains less sodium and it “salts” more. Therefore, it is good for you! 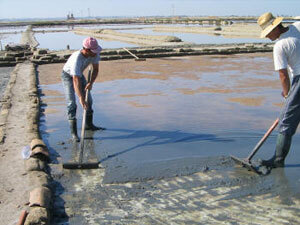 Harvested by hand since the 15 hundreds in the salt pans near Trapani, a WWF reserve. It is an unrefined product extracted from the sea. Since it is not subject to any chemical treatment to make it white, it keeps its vitamins and minerals, mainly magnesium, potassium and sodium which are very important to your health. And it “salts’ more! A pinch of salt is enough to exalt the taste of a food. It comes ground: grosso (coarse) and fino (fine). We also carry the magnificent “fiore del sale“, the flower of the salt. This salt emerges in the salt pan as a soft foam in very particular atmospheric conditions, it is light and soft and it is deposited at the margins of the pan by the wind. Fiore di sale is characterized by an even lighter and more soluble crystals, a smaller quantity of sodium chloride and a bigger quantity of potassium and magnesium than common salt. A very small quantity of fiore di sale is sufficient to salt dishes and, because of its organolectic characteristics, it is used by the best chefs of the world to prepare sophisticated dishes. 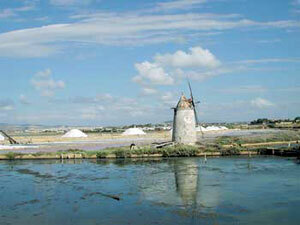 Enzo Gucciardo’s salt pan has been active since 1884 and it is called Moranella. Being a WWF natural reserve, the water is pristine and nature is uncontaminated. In fact, the salt pans are also home to rare birds such as the purple herons and grey parrots. They are so beautiful because they eat the best salt in the world.